As pointed out in my previous post, we woke up at 5:30. The alarm clock rang which was equal to a canon getting fired in my dream. Seconds ago, Jack sparrow had been walking in front of me. Aye. Even though we haven’t slept much at night, it does seem like we sleep in an intense way and so it wasn’t quite hard for me to get up today. 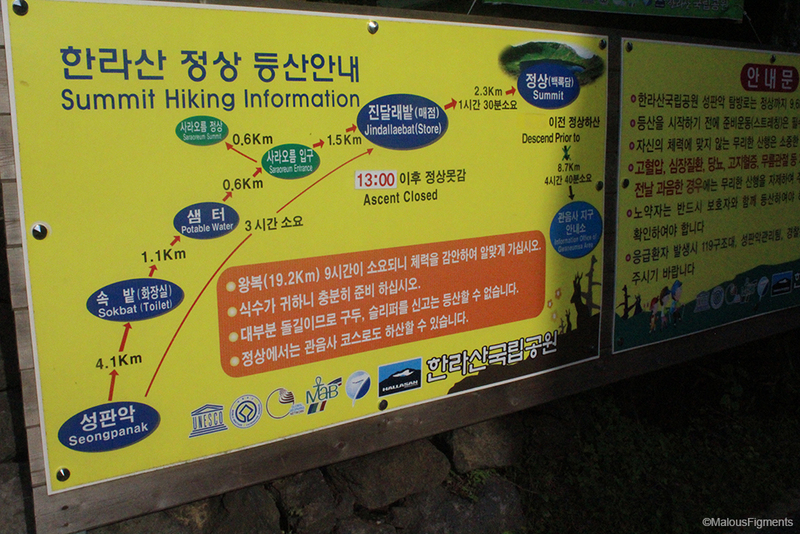 It took us some walking, a taxi and a bus to get up to the right entrance of the mountain trail. After taking a selfie in front of the entrance, we entered at 7:48. 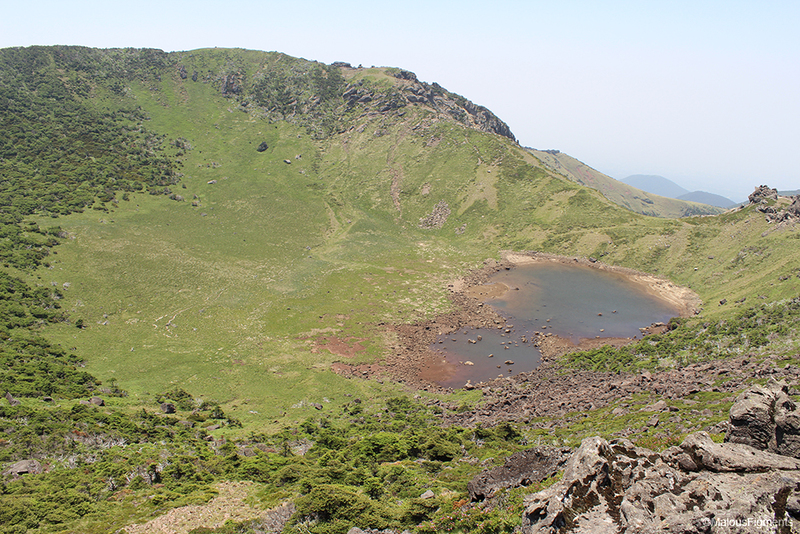 So first off, the Hallasan mountain is the highest mountain in South Korea (1950 meters). The area around the mountain is marked as a national park. 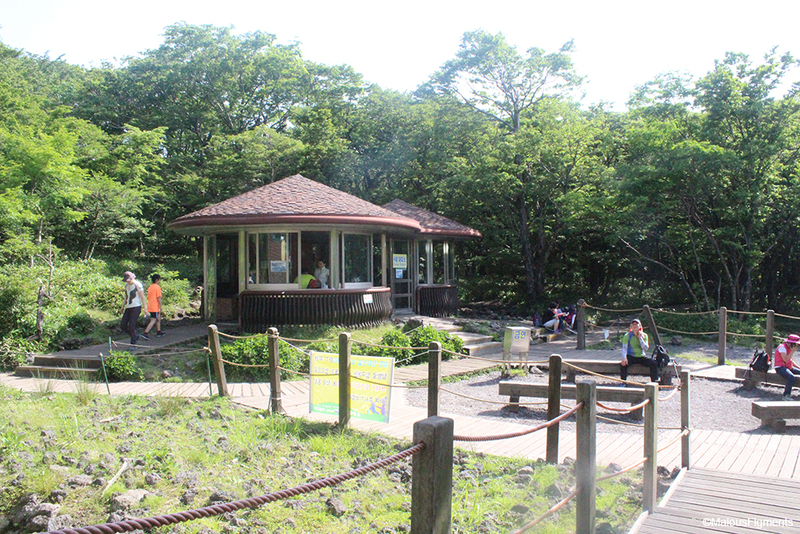 There are 5 different hiking trails of which two lead to the summit of the mountain. 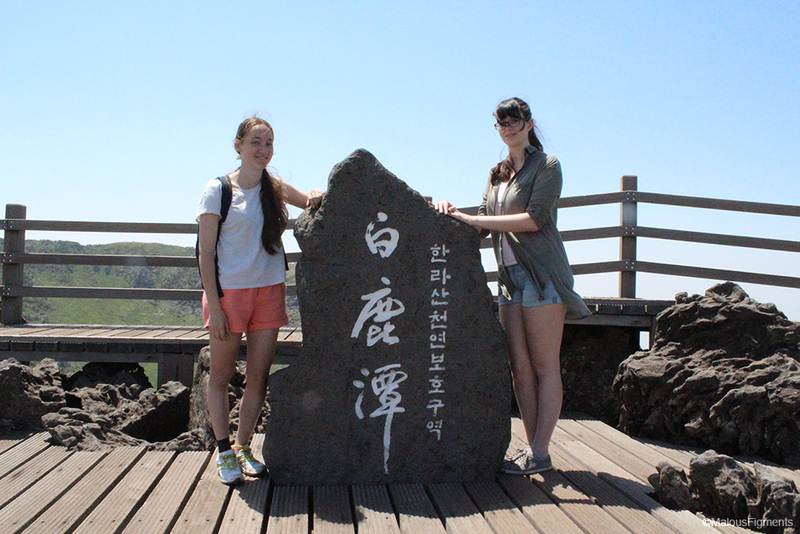 We chose to do the Seongpanak trail of 9.6 kilometres long. This trail is marked as the easiest one and we later figured out that the Gwaneumsa trail of 8.7 kilometre was closed due to the danger of falling rocks. We didn’t have a good idea of what we were getting ourselves into. All we knew was that we wanted to reach the top. 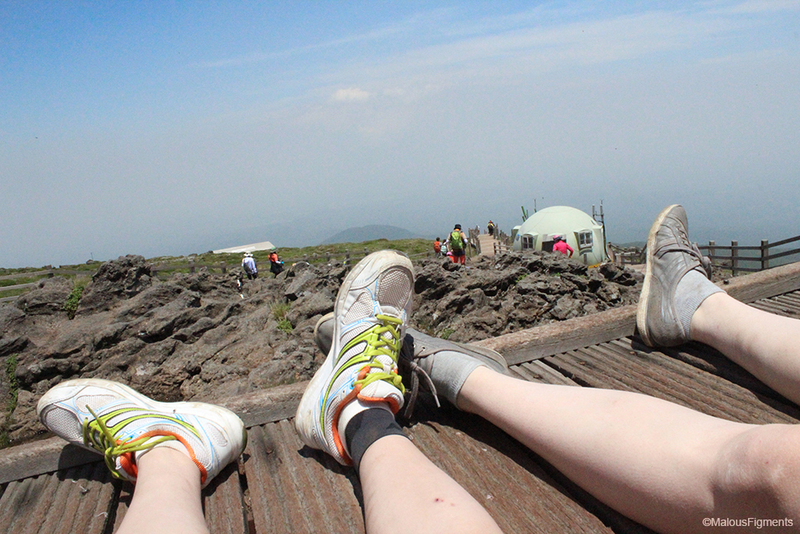 For our hiking trip, we were wearing short shorts (not a good idea with insects). I was wearing running shoes. Since Ina doesn’t have running shoes in Korea, she put on her normal sneaker-like shoes. “In Germany, we wear our normal shoes while hiking,” she said. As for food, we brought triangle kimbap’s with us. This is rice with wrapped in seaweed in the shape of a triangle. Inside the middle, they put several different things depending on the flavour. We also carried two bottles of water, a box of mini cupcakes and suncream. The path started out with stones and it continued like this for the following 4.1 kilometres. Imagine big randomly shaped stones that have been randomly thrown down in the middle of a path of smaller stones. Meanwhile, the route constantly went uphill since… you know… we were climbing a mountain. In the beginning, the stones didn’t seem to be exhausting, but rather annoying. 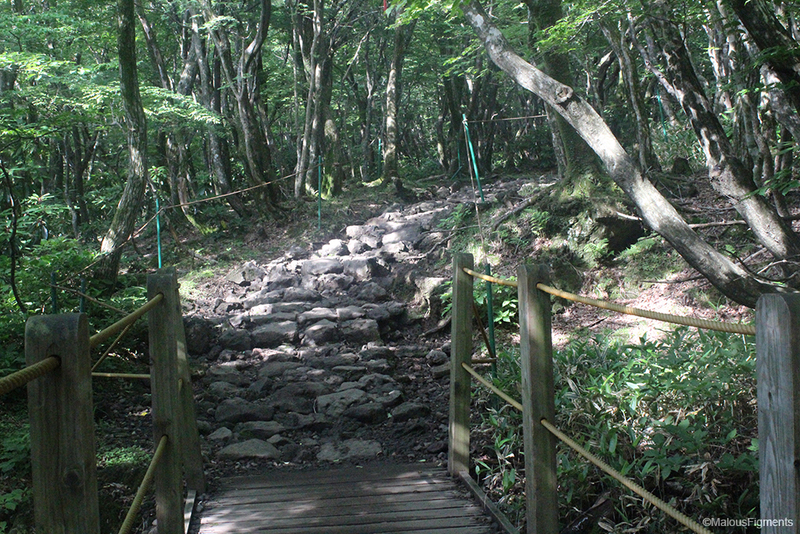 We had expected wooden trails, not trails with stones. Luckily there was a lot of shade but it was humid anyway. 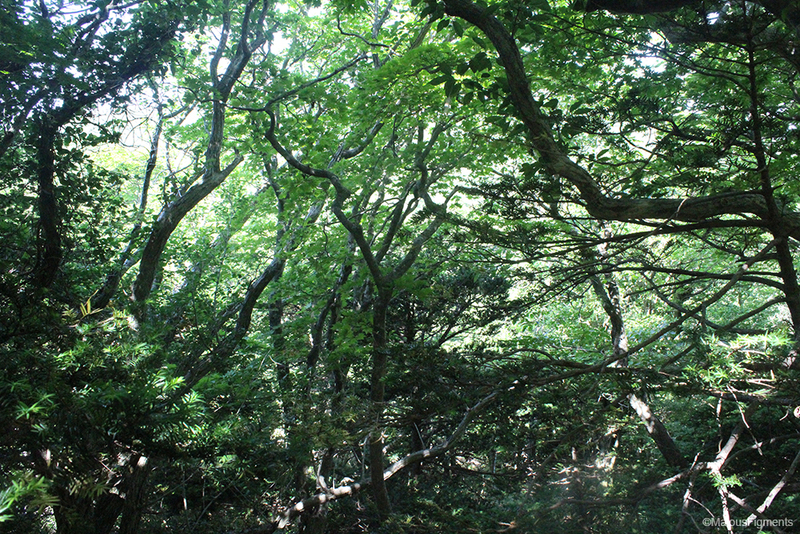 It felt really great to walk in nature. However, we were busier looking down and watching our step than looking around. We reached the first checkpoint after 1 hour and 20 minutes. This means we passed the first 4.1 kilometres out of 9.7 kilometres! After a short toilet break, we continued our journey. The first kilometres were marked as the easy part while the next 3.2 kilometres were described as normal. We did not notice much of a change at first, for the route with the rocks and sometimes a few wooden planks seemed to be the same. 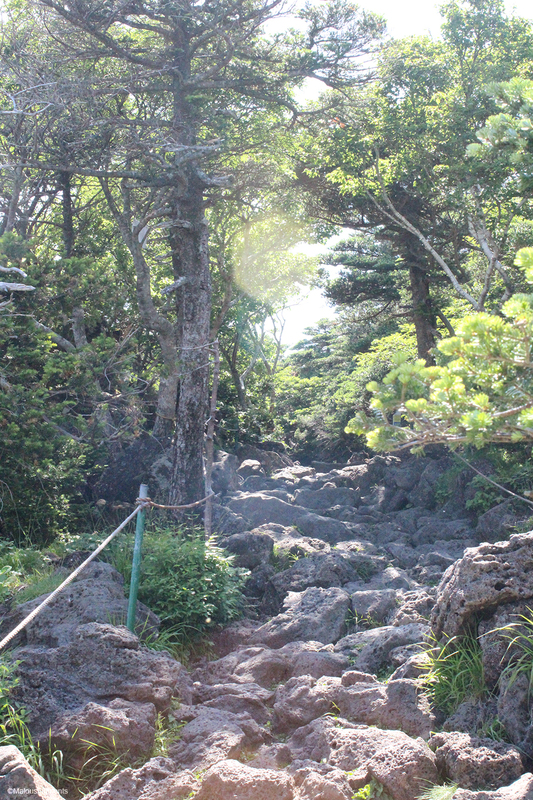 However, at one point the stairs made out of rocks seemed to become steeper, but it did not change all that much. Not so long after the first checkpoint, we found the water tap where we refilled our bottles of water. There was no water at the last stop. With that, I mean absolutely no water. Imagine how great the toilets smelled ;). The next check mark turned out to be a board with information. You got the option to walk up a very steep wooden staircase that would lead to, according to the picture, a crater, or so we thought. It added another 0.6 kilometres plus 0.6 kilometres back to our route. 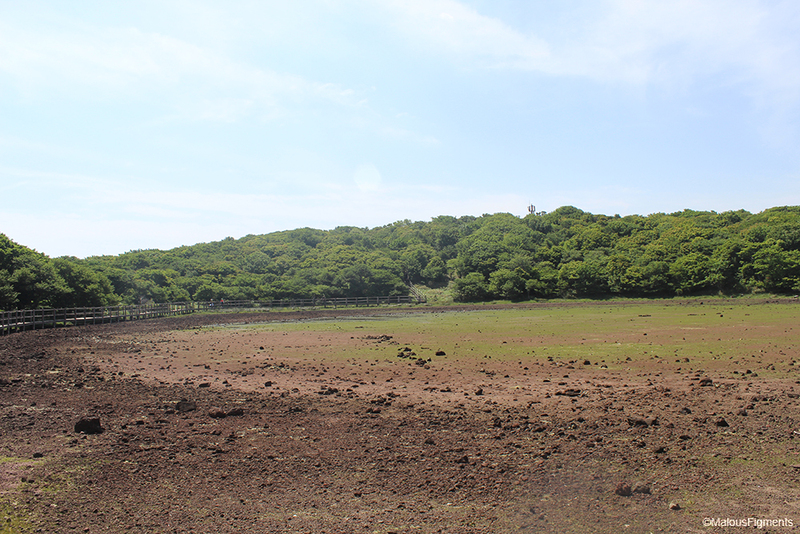 The crater, that turned out to be a lake, did not even have any water. After heading all the way back down we continued up and reached the next and last stop around 11:30. At this stop, you are able to buy food and bottles of water. We bought some hot ramen plus an extra bottle of water. Since there was only one part of the entire mountain where we could refill water, we were desperately in the need for more. It wasn’t that crowded with people when we started in the morning, but it was definitely crowded now. Due to taking breaks on the way, we often passed or were passed by several people who we started to recognise. There was an old European looking man with greyish hair that shared a place to sit down with us. There had been a couple walking in front of us who we passed more than 6 times and at some point, a Korean man tried to talk to me in English. “You are very sporty.” At our last stop, we also saw a group of teenagers which were all wearing the same blue shirt. “I would hate my teacher if he’d take me up here,” Ina said, “I would hate my school if they’d send me up here. I would hate my parents for letting me do this.” “I would hate my classmates for not protesting against having to do this,” I added. Yes, yes, we were climbing the mountain ourselves but it is always different when you HAVE to do it. Anyhow, we reached the last stop in time. 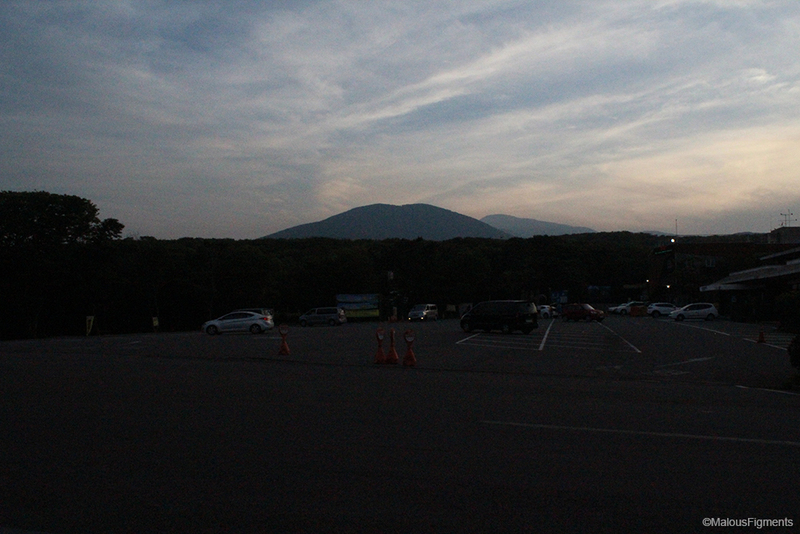 You are not allowed to be on the mountain when it is dark, which means you have to go back down before a certain time. These last 2.4 kilometres are described as the hard part and it quickly became clear why. The rocks were positioned even worse and their shapes weren’t any better. The way up became very steep and some rocks were even loose. It costs me a lot less effort to climb quickly, whereas Ina preferred to have a normal pace. Therefore, I ended up being way ahead because she said it was alright if I did. I passed all the people that passed us before and went three times as fast as everyone. There were a few points where I jumped from rock to rock while everyone looked at me as if I were insane. I first passed the old European man who recognised me too. Not long thereafter came the couple, then the foreign looking woman with a pixie haircut and eventually the Korean who had tried to talk to me. Last time, he literally went after me and started talking once I looked backwards for Ina. This time, he didn’t even bother. I eventually stopped at a viewpoint right before reaching the top with the idea of waiting for Ina here. He reached it 10 minutes later. Then came also the woman with the pixie haircut. She immediately noticed me and grinned. I was sitting, all too relaxed and looked like I wouldn’t get up again very soon. She must have thought that I was too tired by then. She didn’t stop to sit around at least. This viewpoint didn’t provide any shade though. I decided to go on because without a hat it isn’t good to sit in the burning sun of 26C. I reached the top of the mountain around 1:10 pm. The view on the other side was amazing. The crater looks incredible even when it is barely filled with water. As I took my waiting position in the shade, a Korean man offered me some water. I only had my camera with me; Ina carried the backpack. I took a sip and handed it back but he motioned that I could keep it. I didn’t keep it, but the gesture was really nice. Someone else then also offered me food and only a few minutes later another person did too. Koreans always share. It is not about the individual. This became very clear on the mountain today. Ina then also reached the top; not so excited but rather exhausted. (Yes, everyone who reached it, including me, was.) Up there we ate our cupcakes, took some selfies and sat for a little while. There was one stone with the name of the mountain written on it. Several people took pictures with their friends/family members posing next to it. Striking was that everyone formed a waiting line out of nowhere. No one tried to get to the stone first, everyone patiently waited and people offered to take pictures for one another. 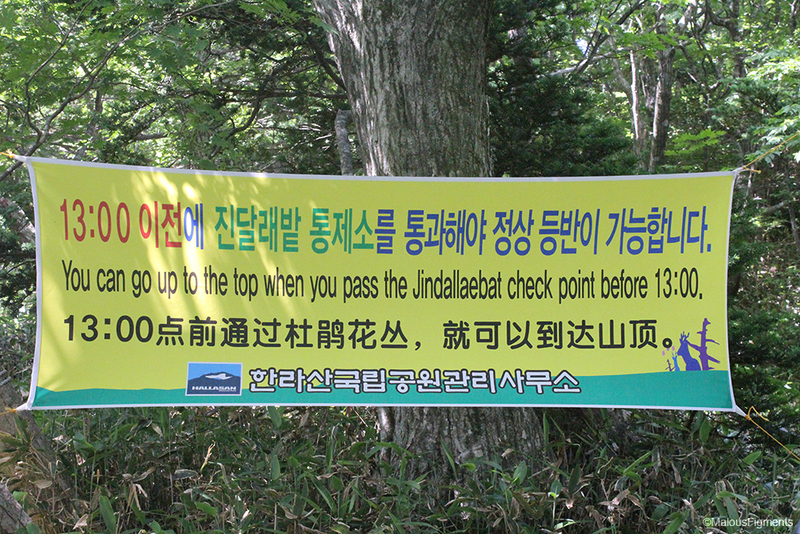 The speaker on top of the mountain started to shout that we had to start heading down (in Korean). Luckily, Ina understands Korean and so we did what the voice coming through the speaker told us to. The way back down was absolutely awful. There is no other way to describe it. In my opinion, going up is a lot easier. Walking and jumping and balancing down the stairs, rocks etc. puts a lot more strain on your knees. On top of that, we were not wearing good shoes for this. We started to feel every single rock under our feet. All the way up, Ina heard that all the Koreans that passes us were talking about our shoes and especially hers. We laughed about it on the way up but definitely not on the way down. On our way down the same conversation was going on between the Koreans. We were literally the topic of the mountain today. My guess is that since we are foreigners, and girls, we immediately catch everyone’s attention. After spotting us, they see our shoes… and the clothes… and our missing climbing equipment. Another thing they often said is: “Is she all alone?” when we weren’t walking as closely together. On the way back, I did stay close to Ina. Our pace drastically dropped. Nearly everyone got off the mountain earlier than we did. 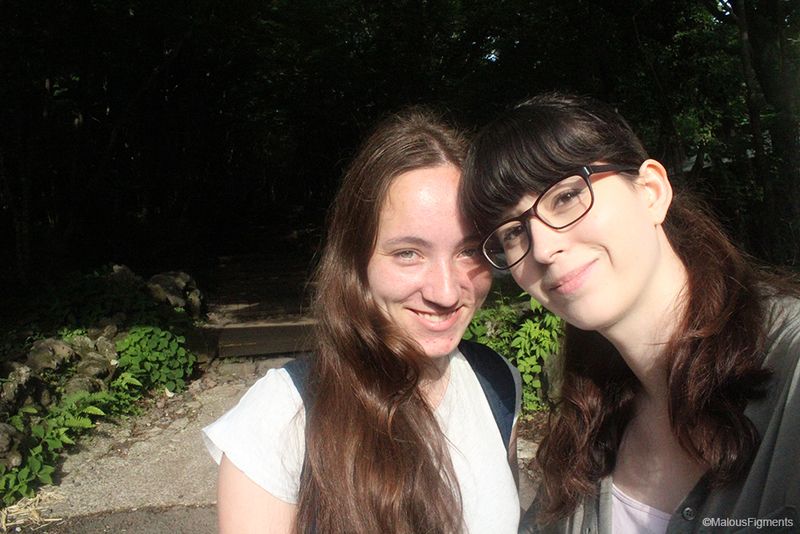 After we walked the first 2.4km, we basically had no soles left, nor energy, nor motivation. It became so bad that one Korean woman ended up lending her walking stick to Ina and she eventually even gave her some Chinese medicine. Ina and I wondered what they’d do if someone broke their leg up there (which seems like something that could easily happen), or if they even counted how many people went up the mountain, in case someone ended up being stuck as soon as it got dark. We saw a few helicopters fly over but they always carried supplies with them. This is how they manage to have a shop up there. But really, it seems like you are all on your own on the mountain. The only ones you might be able to rely on are the caring Koreans/Chinese that is also climbing the mountain. Right now it feels as if I am walking on fire with every step that I take. There is no position to lie in which I do not feel pain. Tomorrow we plan to go to Udo island, but only if we can walk. We have never smelled so bad in our lives. 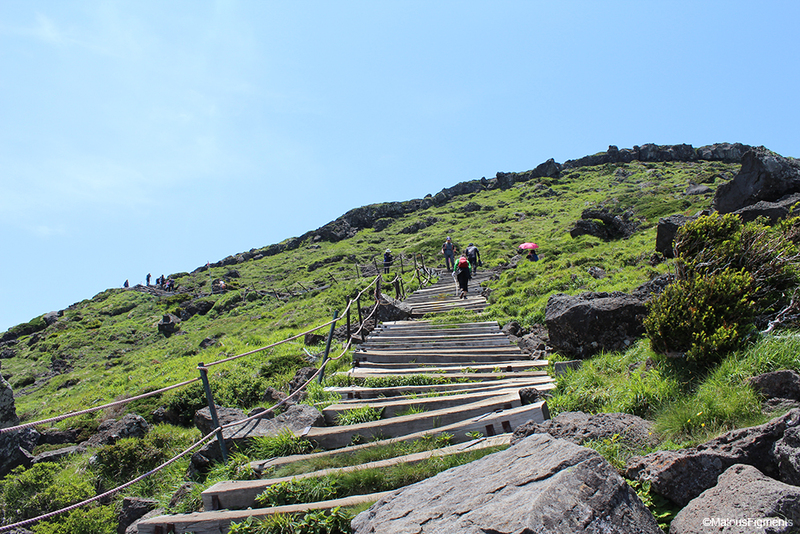 We will never ever go up the Hallasan Mountain again. After all, we can now already say that we climbed to the top of the highest mountain in Korea, but one time is more than enough or rather, overkill. If you like to go hiking, I would definitely recommend doing this. It just so happens to be that Ina and I do not like to walk or to hike and are also not experienced at all. I have no idea why we even did this. “You know, I did this for you,” she said after leaving the McDonald’s (dinner, the only place we knew where to find and for which we did not have to walk more than 100 meters). I don’t know. Maybe that would have been better, huh. Starting time: 7:48 am | Ending time: 7:10 pm. Overall climbing time (breaks included): 11 hours.